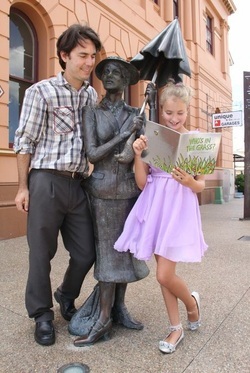 With just a spoonful of imagination - you can jump right into the magical world of Mary Poppins in Maryborough. Mary Poppins is the famous, fictional creation of Pamela Lyndon Travers, who was born above a bank building in Maryborough in 1899. See the former bank building (heritage-listed) where she was born. See striking public art which explores the themes of her novels. Maryborough City Whistle Stop Inc.
All aboard the Mary Ann for a unique steam train ride. The Mary Ann operates each Thursday in historic Queens Park, alongside the Mary River, between Sussex and Macalister Streets. It also operates on the last Sunday of each month. The Whistle Stop Rail Museum at the old Maryborough Railway Station is open each Thursday and on the last Sunday of the month. Free Guided Walking Tour – Explore Maryborough’s historic city centre with your own 19th century costumed guide. Departs City Hall Monday to Saturday at 9am. No booking required. Check out the local and regional artistic talent at this stunning Artspace in Wharf Street at Portside. The exhibits change constantly with local and regional exhibitions. Free entry. Open Monday to Friday from 10am to 4pm and Saturday and Sunday from 10am to 1pm. City Heart Market in Maryborough each Thursday, when the city’s center transforms into a bustling outdoor market with a great variety of art, craft, fresh produce and plants. See the Town Crier and Mary Heritage fire the Time Cannon at Portside Customs Residence Wharf Street at 11am and on the City Hall Green at 1pm. Fraser Coast Wildlife Sanctuary Market every third Sunday of the month from 7am till 12pm. The Portside Heritage Gateway Pass is available from participating museums: Bond Store Museum, Customs House Interpretive Centre and the Maryborough Military and Colonial Museum, and also the Maryborough Visitor Information Centre. Open daily from 9.30am. Wharf Street. Phone: 4190 5722. Brennan and Geraghty’s Store Museum – Visit one of only three preserved retail stores in the world and discover what shopping was like over 130 years ago at this National Trust Museum at 64 Lennox Street. Opened in 1871, the store ceased trading in 1972 complete with stock dating back to the 1890s. Open 7 days a week 10am to 3pm. Nestled in a curve of the Mary River lies Maryborough, a City of contrast, the cultural and historic centre of the Fraser Coast. Take a peek into the good old days. The museum is a virtual time capsule of more than 100 years of merchandising, dating back to 1871. The store includes unsold stocks of curry powder from the 1890s through to toilet paper from the fifties. Grand Shirl's has an outstanding display of antique dolls and toys from the 1800s. Maryborough Heritage Centre - Corner Richmond & Wharf Streets Trace your family history at the Maryborough Heritage Institute or the Maryborough District Family History Society using traditional and modern technology to record and display links with the past. Detailed maps show routes taken by immigrant ships and follow the trails of settlers as they forged into new territory. In the very heart of Maryborough is its most recognisable landmark. The City Hall was erected in 1908 and built in the same grand, colonnade style as Brisbane's City Hall. This colonial home is a living museum furnished with antiques and collectables from 1620-1920 and a modest art collection. Evening lamplight tours available. Take a stroll around the tranquil seven-acre property and relax amongst the beautifully scented roses. Enjoy the award winning Vittoria coffee range, a Devonshire tea or a light meal in The Rose Farm Store. Discover the magic of freshly cut flowers, walk through hues of Lavender, discover gifts in all things flowers, tours, floristry and shady rest areas. Maryborough's city centre transforms into a bustling hub for the Heritage Markets. Held on Thursdays, vendors display a variety of crafts, gourmet food and produce. On public holidays and the last Sunday of the month, Queens Park comes alive with rides on miniature steam trains, brass bands and other fun activities. Also take a ride on the Mary Ann, a full sized replica of the first steam locomotive built in Queensland. The steam train also operates on Thursdays. Enjoy tea, coffee and cake on board the ?Proud Mary? whilst cruising the historic Mary River. There is also a lunchtime cruise available. Bookings essential. Explore the birthplace of Mary Poppins author PL Travers. This self-drive tour will help you discover the city’s unique character and takes approximately 1.5 hours. Discover the rural charms of the Fraser Coast Hinterland. Queens Park – This spectacular, Inner City Park boasts river views, a waterfall, band rotunda, wishing well, children’s playground and picnic, BBQ and toilet facilities. The first trees were planted in 1864, with the majestic Banyan Fig planted well before 1900. Ululah Lagoon – The Lagoon was first cleared in 1859 to form Maryborough’s water supply. It is now a beautiful park and bird sanctuary with a skate park, children’s playground as well as BBQ, picnic and toilet facilities. Fraser Coast Wildlife Sanctuary – Feed Kangaroos, Wallabies and Emus, check out Reptiles and Pythons and learn more about Australia’s largest predator the Dingo. Open 7 Days 10am to 5pm. 79 Mungar Road. Fraser Coast Discovery Sphere – The Fraser Coast is a stunning tapestry of nature’s wonders. As part of the Great Sandy Biosphere, our diverse natural attractions are officially recognised in the same class as the Galapagos Islands and Central Amazon. The Discovery Sphere provides the ideal starting point to immerse yourself in the beauty of our region. Open 7 days 10am-4pm. 166 Old Maryborough Road, Pialba. Fraser Island – A World Heritage wonder and a must do on any east coast itinerary. Experience a relaxing escape, a fun family holiday, a 4WD adventure or a romantic getaway. Tour bookings available at the Visitor Information Centre. Affiliated with the Australian Light Horse Association Ltd. and registered with Museums Australia. Phone appointments only. Discover Maryborough's colourful past with a one-hour guided walk with city ambassador Mary Heritage. The walks depart 9am, Monday to Friday, from City Hall in Kent Street. Colourful bollards overlook the Mary River from Macalister Street. They represent a sea captain and family of immigrants landing in 1860. Over 100 years old, picturesque Queens Park overlooks the Mary River and features a waterfall, lily pond and band rotunda. The Park was vested as a Botanical Gardens Reserve in 1864. Note the many tine trees, including the magnificent Ban Yan Fig, planted about 1900. The park has picnic tables, barbecue facilities, toilets and a children's play area. Take time to smell the roses in Elizabeth Park with over 3000 flowers. The park was a cemetery until 1812. Horse-drawn scoops were used to clear the billabong in 1859 to form Maryborough's first water supply. The area is now a beautiful park, centred on the lagoon and bordered by a walk and cycle path. There is a skate park, children's fort, flying fox and other play equipment, barbecue and picnic facilities and a toilet block. Just a short 11.5km drive from the City, Teddington Weir has barbecue, picnic and toilet facilities, children's play area and wading pool. Take a walk along the Vineforest Trail, a patch of remnant ?dry rainforest? with over 200 plant species. Situated 20km south of Maryborough, along the Cooloola Coast Highway. Maaroom is a small friendly fishing village on the water front with views to Fraser Island. Bring your fishing gear or just enjoy the breathtaking bird and marine life. across the water to Fraser Island.